“Like in the car industry, some [watch] designs become mythical, because it was probably a very unusual and distinctive design at the time, and then subsequently transcends trends of the decades” — an insightful description on why some watches are considered holy grail, according to IWC’s CEO, George Kern. For men, watches often serve as a luxury symbol holding a certain gravitas that other accessories may not, also offering an outlet for personal style expression. Needless to say, a watch says a lot about its wearer. An essential component of men’s fashion, horology is a complex subject with a huge variety of selection, so we’re here to guide the way with some timeless pieces you should know of. Obviously, this list is not exhaustive and solely includes brands and models we thought the HYPEBEAST reader would gravitate to. With that said, read on to see our picks, and make sure to check out our Guide to Watches. In the watch world, Rolex may be one of the most recognized names — and for good reason, its watches stand the test of time and are made to the highest quality possible. A Rolex watch has even helped solve a murder. Out of Rolex’s range of offerings, none are quite as iconic as its Oyster Pertetual. Launched in 1926, the Oyster Perpetual was the first waterproof watch in the world. The signature Oyster case coupled with the mechanical Perpetual movement system, the watch has stood the test of time for its innovative beginnings. Influencing many other Rolex styles that came after it, the Oyster Perpetual comes in various face styles and sizes and is often the choice when someone is looking to purchase his or her’s first luxury watch. However, the watch itself should not be confused with Rolex’s Oyster Perpetual line, where it includes all watches that uses the Oyster Perpetual technology. Learn more on Rolex.com. Apart from the Rolex Oyster Perpetual, another iconic watch in Rolex’s lineup is the Submariner. Also an Oyster Perpetual style (for its use of the Oyster and Perpetual technologies), the Submariner is known for being one of the best diving watches ever made. Introduced in 1953, the watch was used by deep sea divers for its capabilities to monitor diving time and decompression stops. The watch is fitted with a Triplock winding crown, likened to “a hatch of a submarine.” It’s rated waterproof up to 300 meters, but needless to say, not many wear a Rolex for diving purposes. The Submariner was also made famous for place in the James Bond franchise (before Omega stole the show). Learn more about it on Rolex.com. Along with Rolex, Cartier is one of the most recognizable luxury brands in the world. However, the brand may be better known for its pieces of jewelry than its watches, but Cartier’s history in watchmaking is nothing to overlook. Cartier’s first watches were introduced in 1912 (with movements supplied by Edward Jaeger, of Jaeger LeCoultre), and the Cartier Tank was introduced in 1917. Designed by Louis Cartier himself, the Tank was inspired by the newly introduced tanks on the Western Front during World War II. Sporting a recognizable rectangular face, the watch has seen a multitude of iterations since its inception. The most recognizable ones though, would have to be the Tank Anglaise and Tank Francaise. Learn more about Cartier’s Tank watches at Cartier.com. Audemar Piguet is arguably one of the most highly regarded timepiece brands out there, even trumping the other uber-luxurious names on the list. the crown jewel of Audemars Piguet’s lineup though, is its Royal Oak. Setting a standard for fine horology, the Royal Oak was introduced in 1972 and was concevied overnight by legendary watch designer Gérald Genta. After receiving a call from Audemars Piguet’s managing director Georges Golay, who needed “an unprecedented steel watch,” Genta produced the Royal Oak. At the time, the watch was revolutionary for its design, which featured an octagonal face, sharp angles and visible screws. This was a huge departure from the luxury watches at the time, which were all round, slim and gold. Genta was inspired by the British Royal Navy’s HMS Royal Oak, which in turn was named after the “Royal Oak,” a tree in which King Charles II hid in to escape Oliver Cromwell — the “Royal Oak” went on to be a symbol for power and protection. Learn more about the Royal Oak here. Back when IWC was still know as International Watch Company in the late 1930’s, two Portuguese businessmen ordered wristwatches housing the precision of marine chronometers. However, at the time, the only way of providing such accuracy was using a large pocket watch caliber. Therefore, to fulfill these needs, IWC housed the pocket watch into a wrist watch case, resulting in what was known as a “large wristwatch.” This was innovative and ahead of its time, setting standards for accuracy and precision, while its bulky design stood apart from the dainty, rectangular Art-Deco-inspired designs prevalent at the time. Learn more about the iconic Portugieser at IWC.com here. 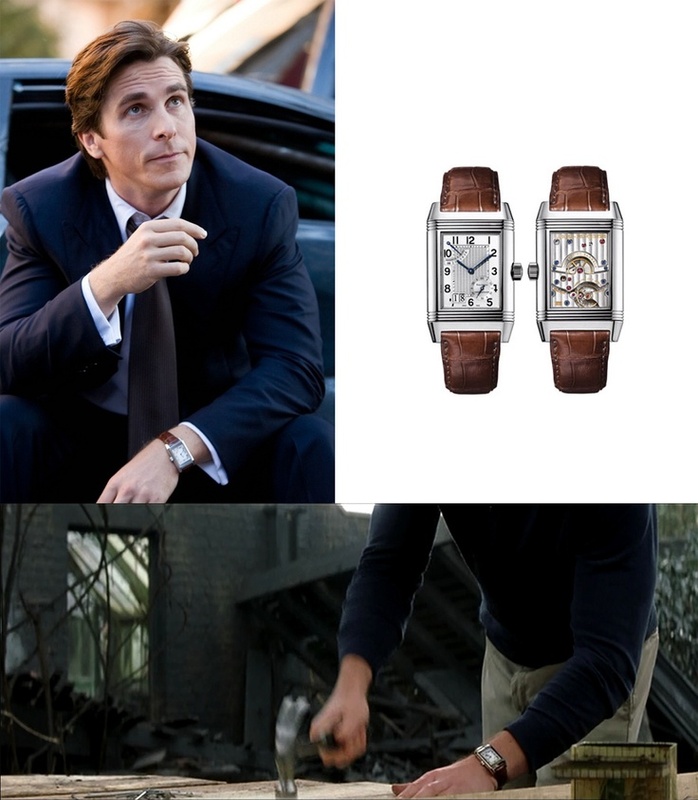 Jaeger-LeCoultre is anoth er highly regarded luxury Swiss watch maker. The brand itself was founded in 1833, and holds hundreds of inventions as well as over a thousand calibers to its name. The most iconic watch in Jaeger-LeCoultre’s lineup is probably the Reverso, named after the Latin words for “I turn around.” Created in 1931, the Reverso is known for its ability to turn its watch face, essentially hiding it. This function was developed so that the watch could survive hard knocks from horses during a polo game, protecting itself from shocks while also allowing for a beautiful engraving upon its back. However, now, the Reverso comes with iterations that feature two different watch faces that can be flipped around. Learn more about the watch here, and see it in action on JAY Z’s wrist in Justin Timberlake’s “Suit & Tie,” oh, and it’s also Batman’s watch of choice. The first watch to walk the moon — need we say more? Omega’s Speedmaster Moonwatch is often highly considered for one’s first luxury watch purchase. Introduced in 1957, iterations of the watch has accompanied all six of NASA’s piloted missions. When Buzz Aldrin stepped on the moon in 1969, he was wearing an Omega Speedmaster, the name “Moonwatch” came after, forever immortalizing the watch’s undeniable role in the outerworld exploration. Characterized by its precision, readability and robustness, the watch is surely one to note. Learn more at OmegaWatches.com. Probably one of the fanciest looking watches on this list, the Richard Mille Tourbillon is definitely not for the faint of heart. In fact, its loud and bold design is what the watch is known for. Relatively new, the first RM-001 model was introduced in 2001 and was iconic for its ridiculous pricing at the time. Put into comparison, an RM watch at the time would cost upwards of $100,000 USD, while legendary watches from Patek Phillipe would be atound the $50,000 USD mark. Despite the crazy pricing, Richard Mille somehow made people comfortable with paying multiples of what they were used to shelling out. In other words, Richard Mille proved that people were willing to shell out enormous amounts of money for stellar watches, paving the way for some of the most beautiful and incredible watches that came after it. Read more about the Richard Mille Tourbillon at its site here. Panerai is another legendary name in the watch game. Founded in 1860, the brand first patented its Radomir technology — a radium-based powder that provides luminosity to the dials of sighting instruments. Its high visibility and adhesive qualities even under water made it an essential element for the Royal Italian Navy, allowing them to see the time in darkness and under water. Eventually, Panerai introduced the Luminor technology, which is self-luminous and replaces the Radomir, and known for playing an important part in WWII for the Italian forces. The brand experienced a resurgence in 1995 when Sylvester Stallone famously purchases a Panerai in Rome. Now, the Lumior is an iconic style from the luxury brand. Most of the watches in Panerai’s lineup looks similar, but with its iconic brushed case and bulkier design, completed with — of course, its luminous details. Learn more on its site here. Hublot is another relatively new player to the horology game, having been founded in 1980 by Carlo Crocco focusing on timepieces for water sports. The word “Hublot” translates to “porthole” in French, and the brand is known for its “Art of Fusion.” It was a pioneer in introducing rubber bands to sports watches, as Crocco was a sailor and found himself unsatisfied with the metal and leather straps prevalent at the time. Although consumers were skeptical of rubber in luxury watches, the versatile and durable material eventually became the go-to for sports watches. The brand introduced its signature style — the Big Bang, in 2005 which features a rather bulky silhouette and a round face with visible screws. Featuring 257 different components, the watch is now one of the most popular luxury watches — oh, and was the watch featured in JAY Z and Kanye West’s video for “Otis.” Learn more about it here. A staple slip-on that focuses on superior construction. Playfully deconstructed designs in commemoration of two special Birthdays. Reebok Instapump Fury "Rain Drop"
A colorful take on the classic silhouette. This is not your dad’s Dodge Charger.